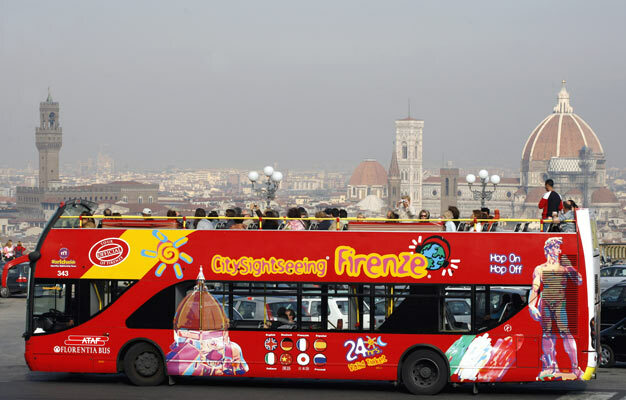 Discover incredible Florence from the top of the Hop-On Hop-Off buses! Sightseeing has never been so easy! Onboard the Hop-On Hop-Off bus, you'll find an interesting audio guide which will provide you with information about everything you see from the bus. 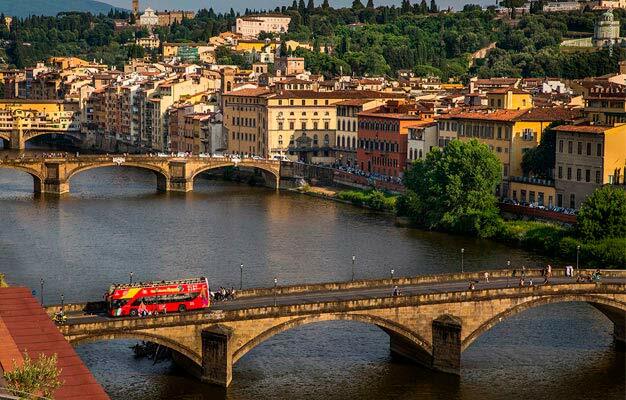 CitySightseeing offers 3 different bus lines, so you can get to most of the places of interest of the city - from Piazzale Michelangelo to Ponte Vecchio to the beautiful Fiesole. Onboard you will find interesting commentaries which will provide you with information about everything around you: you will listen not only to the history of its elegant palaces, buildings, and monuments but also to legends, historical events, popular sayings, gastronomic curiosities and much more. You can hop on or off at the indicated stops as many times as you want and get closer to the places you want to see! Just bring your e-ticket to the first bus you want to take and hop on! Your tickets are valid for either 24, 48 or 72 hours. You can redeem your ticket up to 5 days after the tour date you have chosen. Where do the bus depart from? Line A, B and C depart from Piazza della Stazione. Line C also departs from Piazzale Montelungo. Line A lasts 60 minutes and line B and C lasts 120 minutes. Line A run every 15-30 minutes depending on the season. Line B and C run every hour. Line A has 18 stops, line B and C has 24 stops each. Children's tickets are available for children between age 5-15. Children under age 5 are free when accompanied by a paying adult. The buses run from 9 AM to 7 PM, depending on the bus line.